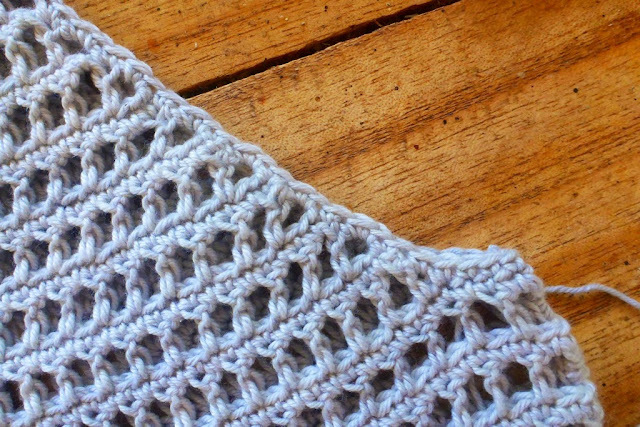 This is an exercise in shaping. 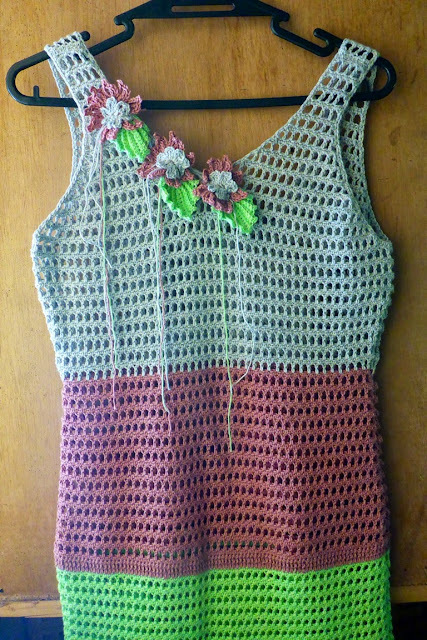 I have taken a look at crocheted dress scehmatics on the Garnstudio.com website. 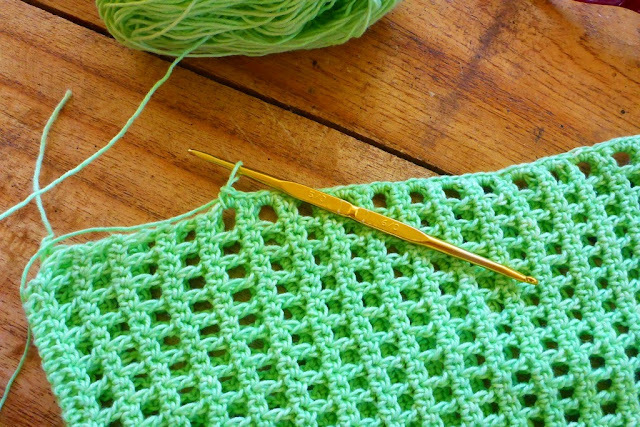 Then I try to follow the measurements and shape using simple crochet stitches. 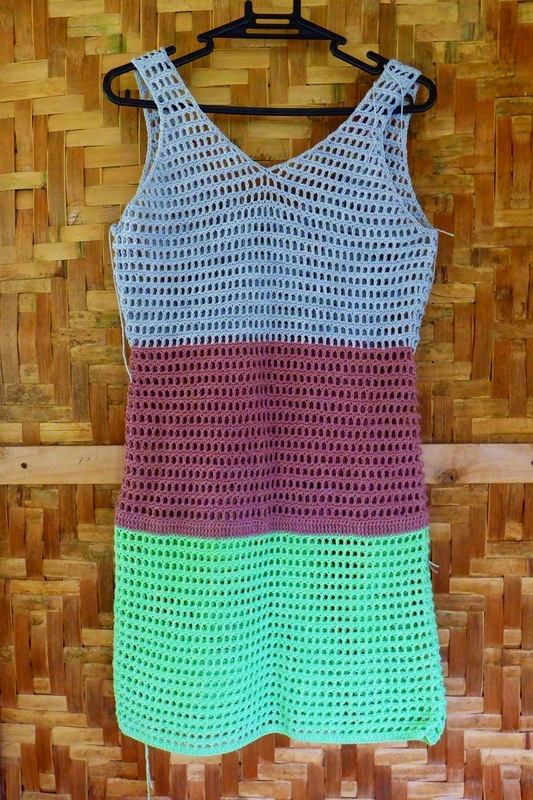 My first example is a dress worked in 4-ply cotton yarn and 3mm hook. 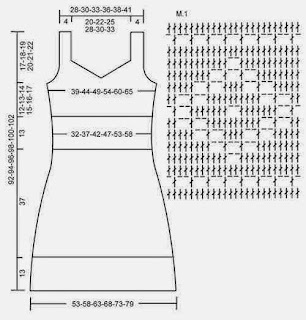 As advised in the Garnstudio.com website, I hold up the dress when measuring, because the weight of the yarn stretches and lengthens. The cotton dress use a simple mesh stitch pattern, a good beginners exercise, because it is easy to increase/decrease and shape. 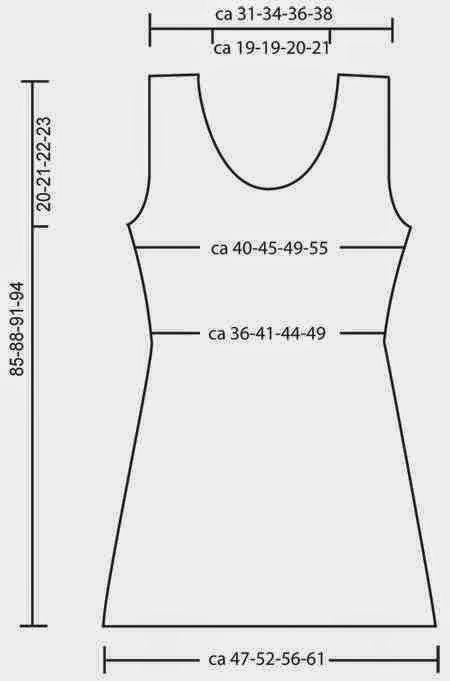 Here (photo below), places where shaping is made is indicated. 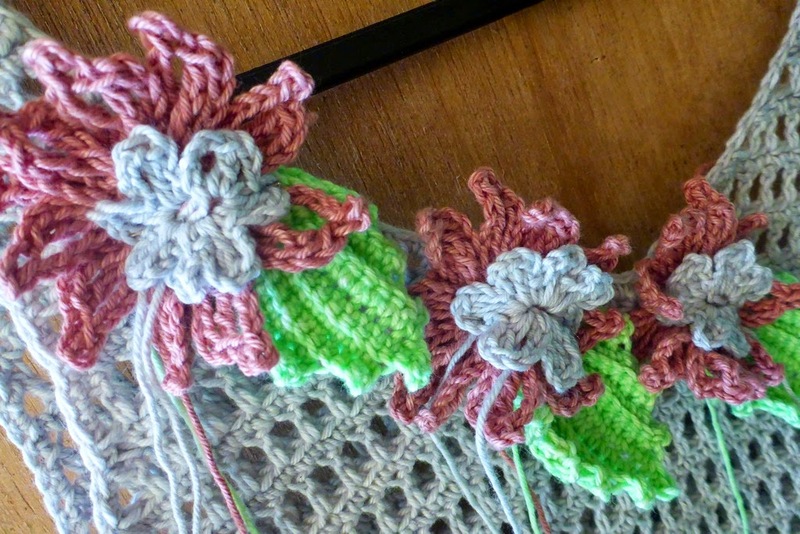 I use different colours for the areas that have decrease and increase. 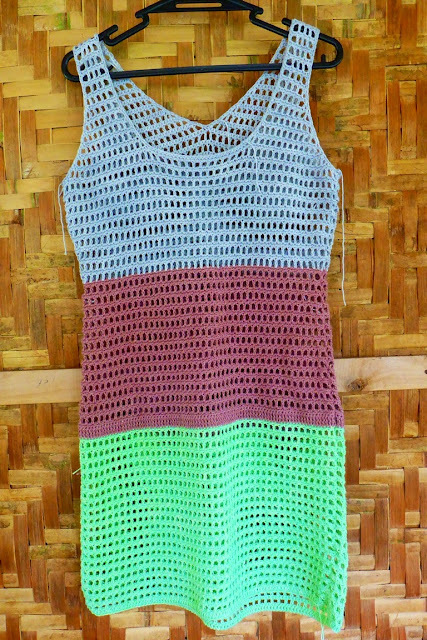 Start crochet at the bottom (green yarn), go up. 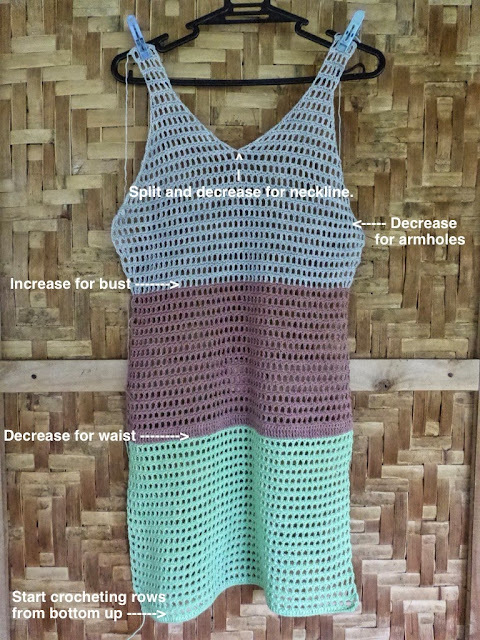 Decrease (purple yarn) for the waist is gradual by 2 stitches at each side, starting at upper portion of hips, go up, continue decreasing, for at least 7+ inches of row height. 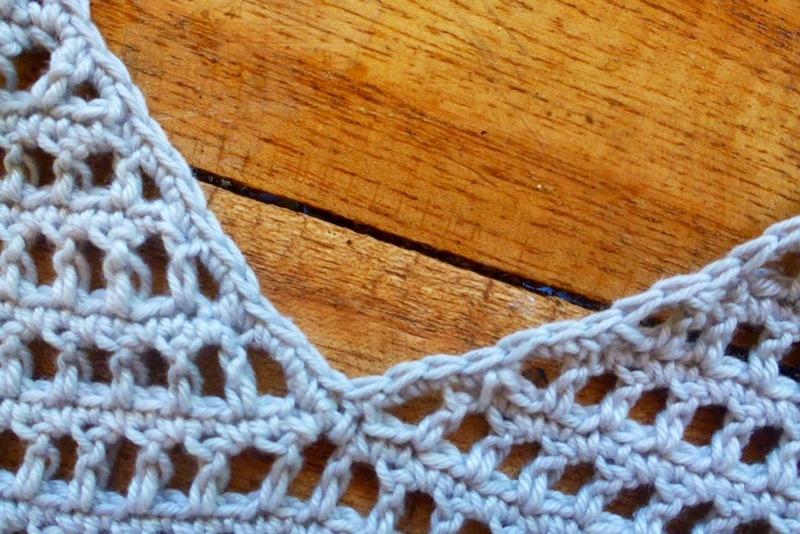 Increase starts at base of bust (grey yarn) also at 2 stitches at each side, for at least 4 inches towards the armpit. 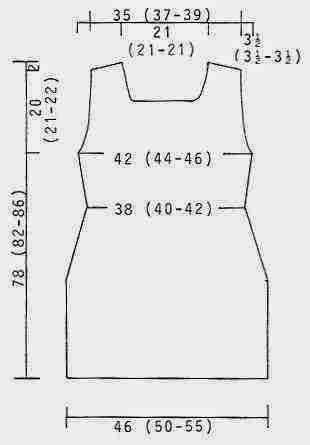 Then decrease dramatically, 4 stitches at each side on first row, to shape the armholes. Continue decrease for armholes now gradual at 2 stitches at each side, for 2-3 more rows. Then split for neck and shoulders! That’s it! 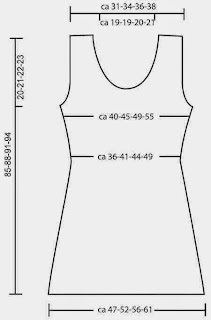 Make the back and seam along the sides! 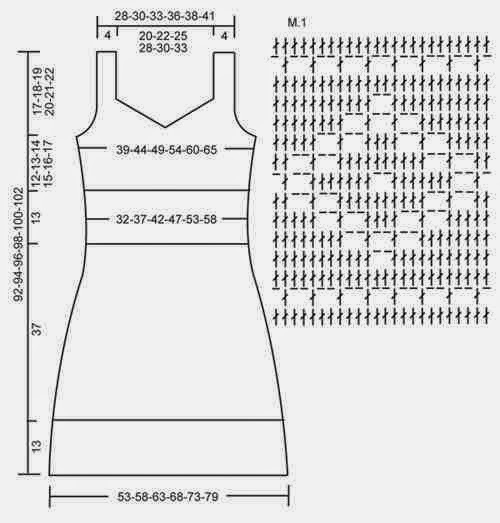 The usefulness of making a schematic is that you can make a dress that fits you. 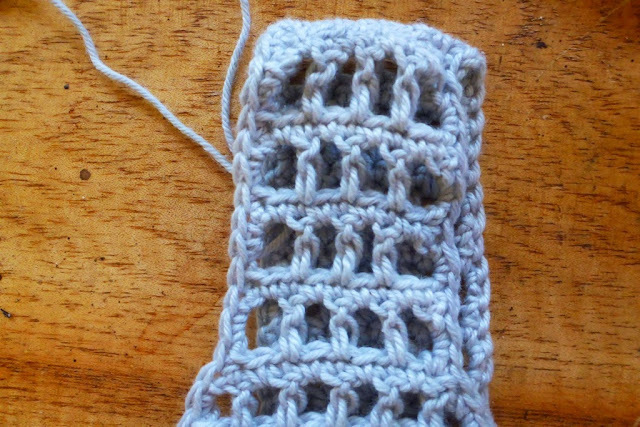 I’ve also been looking at various schematics from various crochet patterns, looking at their measurements, and then trying it out in crochet with different kinds of pattern stitches. 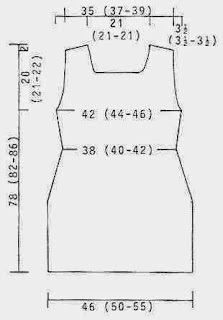 I have finished the front and back sections of the dress. Hardest part was matching the two sides together, especially the shaping of armholes. Always measure with the piece hanging up, to get the right measurement taking into account the weight of the yarn. I seamed the sides of the dress with sc stitches which will make the dress stronger and not sag. I crocheted sc stitches all around armholes and neckline, also to strengthen these areas and prevent sagging. 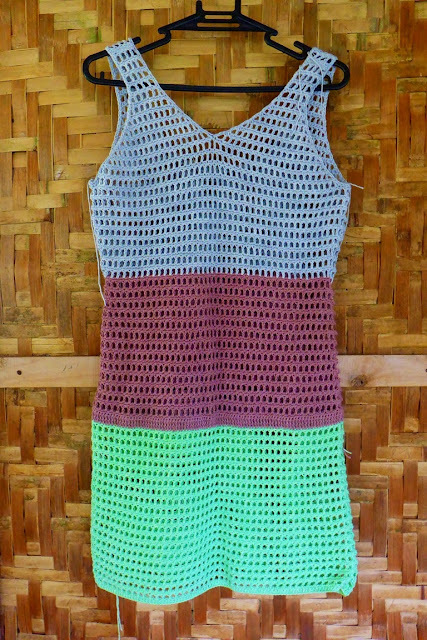 Note: Never weave in ends until you are perfectly happy with the fit of the dress. So you can still unravel the sections you want to change. 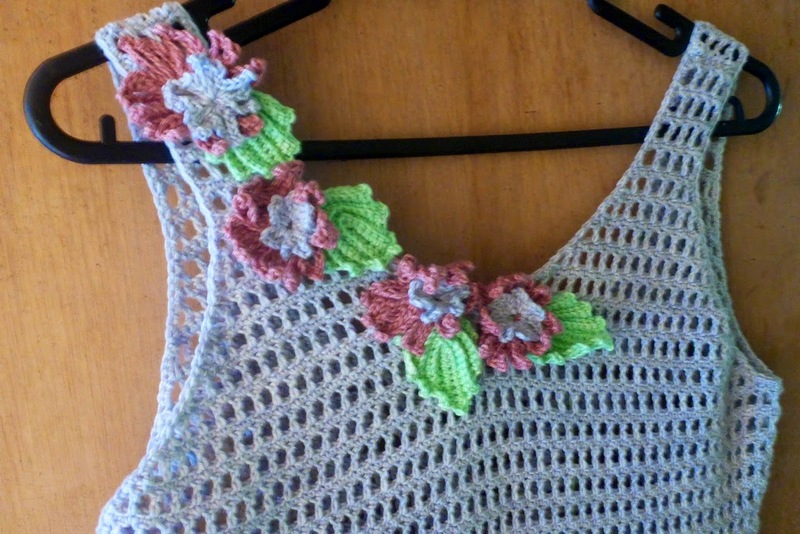 Then I decided to decorate the neckline with crocheted flower and leaves. I pin the flowers and leaves first, then when I am happy with the arrangement, I sew them on. This is an excellent tutorial! Thank you for taking time to explain in detail. Very beautiful creation!